Pope Francis meets PA chairman at Vatican, briefs him on "Israeli violations against Palestinians". Pope Francis on Monday called for the implementation of a “two-state solution” to solve the Israel-Palestinian Arab conflict. His comments came during a meeting with Palestinian Authority (PA) chairman Mahmoud Abbas at the Vatican. 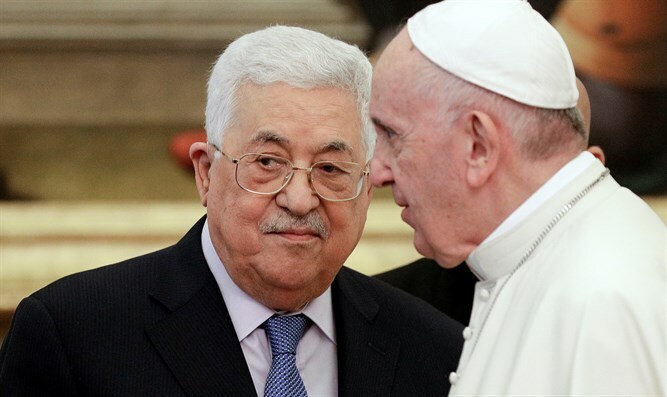 The PA’s official news agency Wafa said that Abbas briefed the Pope on the latest developments in “Palestine” and the implications of the US decision recognizing Jerusalem as Israel’s capital and moving its embassy to the city. “Particular attention was reserved for the status of Jerusalem, underlining the importance of recognizing and preserving its identity and the universal value of the holy City for the three Abrahamic religions," the statement said, according to Wafa. The Vatican recognized “Palestine” as a state in 2013. Last year, the PA opened an “embassy” in the Vatican. This occurred after an accord between the Holy See and the PA on the establishment of an “embassy” took effect. During a 2015 meeting with Abbas, the Pope referred to Abbas as "an angel of peace", causing outrage on social media. The Vatican later explained that the reference was mistranslated, and in fact was meant as encouragement for Abbas to pursue peace with Israel.